This book is a conglomeration of intuitive thought built upon several esoteric themes. 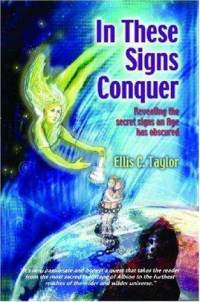 The ideas that author Ellis Taylor provides in its pages are certainly original. He maintains that these ideas come to him through influence of a discarnate mentor going by the name of Merlin, and originate from the Goddess Venus, who also takes on various other feminine guises. "Ideas are pristine instantaneous messages unblemished by intellect at the point of reception. Only when the conscious mind (ego and intellect) gets involved does the inspiration become flawed. Conventional thinking...is basically just another word for ignorance through terrorist conditioning and hence all human judgements are inept through their blighted vision of the full picture." So, bearing that in mind, I shall attempt to provide an honest, if inevitably inept review. The book's title is a paraphrase of Constantine's calls to Christian arms. Christianity is one of the running themes through the book, and the Chi-Rho symbol allegedly linked to not-so-early Christianity comes under Ellis's microscope. He reveals through numerological examination that these symbols denote subjugation and duplicity. Fair enough perhaps. At that point, Ellis gives us a bit of biographical detail of the life of Bill Gates, and shows how the same Chi-Rho symbolism applies to the Windows XP computer system. This form is repeated throughout the book: factual information, then esoteric analysis, and finally what psychologists would doubtlessly refer to as Free Association. In this way Constantine, the bringer of Christian 'Civilisation', is linked to Microsoft. Their common bond? Their immersion in the Darkness, a concept of dehumanised Saturnine Totalitarianism which has ruled over us throughout the Age of Pisces. "How the hell nailing someone on a cross would take away the sins of the world I cannot fathom. An 'Almighty' just would not need to do that. Only a Saturnian (sic) one would resort to such a despicable deed. But it isn't true, it is all a symbolic story that we have all been forced to believe in. Great souls like Plato, da Vinci, Francis Bacon and many others realised, or are already aware of, this and they transferred their knowledge in their time machines of art and literature. Like a Dr Who Tardis they have arrived and now we are ready to recognise them. The light of Venus is flashing." "I realise that I am attempting to unravel the languages and attitudes of long ago and I'm sure that scholars will disagree with me but I have moved in other worlds and my understandings are coloured by that. I know that it is perfectly possible for Plato to have been talking to the future about the past; and so, would he not use terminology understood by our time, and could not Creation have ensured the new humans of this epoch could equate it?" They say that you cannot make an omelette without breaking eggs. The same is no doubt as true for scrambled eggs, and it is this form that 'In These Sings Conquer' takes. It's not so much an omelette as a plate of scrambled eggs. The whisking fork used to beat these eggs (which, if I may stretch the analogy further, represent Ideas) has three main prongs: Numerology, Anagrams and Word Association. As in a game of esoteric Charades, words are broken up into constituent components and spun about by the author. Patterns emerge through associations with stars (particularly 3rd magnitude Alcyone in Taurus (? )), mythology and Antipodean terms. The source material that Ellis draws upon is rich and diverse, much of it deeply embedded in esoteric lore. Remarkably, the author even offers a "Glossary of English and Antipodean Terms" to explain some of his conversational-style slang! "Saturn's traditional number is 4 and hence is attracted to numbers that include, combine and are multiples of 4; e.g. 24, 8, 76 and 16. Another favourite number is 6 because this relates to the cube, which is 4 sides and 4 squares also giving 16. You will find many church towers have 16 battlements. It is also the number of the Tower of Babel in the Tarot." It's like a game of esoteric scrabble. To my mind, it's all a little redundant. I find myself agreeing with Ellis about a great deal of the general thrust of his ideas. He shows immense wisdom and common sense, and he displays excellent empathy with his reader. I suspect he's a very likeable chap, and very interesting conversationally. And he doesn't wear a watch, a personal hallmark we also share. But you don't need to get to his conclusions through this hickledy-pickledy, free-association route: they can just as readily be attained through an intellectual examination of the way the world works. Yes, the world IS dominated by a set of Masculine Institutions whose sole purpose is to maintain their own power. Intuition IS culturally subjugated by Rationalism. Christianity IS built upon a quagmire of myth and lousy editing. Artists and writers DO hide meaning in their work, even more so when they present heretical ideas to a cruel world. There's a book by Bob Frissell called "Nothing in This Book is True, But It's Exactly How Things Are". It reminds me of 'In These Signs Conquer'. Both are highly speculative. Neither stands up to critical examination. Yet, you come away with an alternative view of the world which has merit. How is that? Probably because the human condition is not just about rationality. We do have an intuitive side. We do have a foot in the spiritual camp, and access to ideas beyond our mortal selves. It is a brave move to believe in those ideas, particularly when they may appear beyond reason. Ellis Taylor displays an impassioned belief in the freedom of thought, and in individual pathways to Truth, and I'm impressed that he wrote a very open and honest book explaining his sometimes wild and speculative thoughts. His ideas may resonate with you. An example of a time they worked for me were when he discussed the way we have been conditioned into coerced life-patterns, especially pertaining to time-management. We no longer follow our natural body cycles and rhythms, and have partially lost the timeless connection to our unconscious through our dreams. Our lives have been industrialised, the purpose for which lies beyond our individual control. Books like 'In These Signs Conquer' wake us up to this, and to other possibilities in the way we view our world, inner as well as outer. Subtitled "Revealing the Secret Signs an Age has Obscured"